This post explains things to look for in a keyboard that will make it easier to use the most common keyboard shortcuts in Excel for Windows. I also recommend some great keyboard that meet these criteria. Looking for the best keyboard to use with Excel? This post explains things to look for in a keyboard that will make it easier to use the most common keyboard shortcuts in Excel for Windows. As you use Excel, you quickly realize that using keyboard shortcuts will save you lots of time and improve your productivity. This means that the layout of your keyboard is crucial to performing many of these shortcuts. Keyboards come in all shapes and sizes, with a lot of variation in the actual layout and location of the keys. This is especially true for laptop keyboards. Some laptop keyboards have keys completely missing. Others create multi-purpose keys which requires a function key to be enabled before the key can be used. This will slow you down when trying to perform a keyboard shortcut in Excel. Whether using an external keyboard or laptop, there are many things you will want to consider when purchasing a keyboard. The following is a list of the keys you will use most often when working with Excel. I explain what to look for when purchasing a keyboard to help make you more efficient and save time. Many of these comparisons are a matter of personal opinion, and this should be used as an informal guide on what to look for. Ctrl – Copy (Ctrl+C) and Paste (Ctrl+V) are probably two of the most common actions in Excel. There is a shortcut for almost every letter and number on the keyboard when combined with Ctrl. So the Ctrl key is used frequently, and the placement of the Ctrl key is important. On most external keyboards the Ctrl key is at the bottom left corner of the keyboard, making it easy to find with your left pinky finger. However, not all laptop keyboards share this layout. Often times you will find a Function (Fn) key in the bottom left corner, and the Ctrl key located to the right of it. This can make the Ctrl key a bit more difficult to find and takes some getting used to. The location of the left Ctrl key is definitely something to consider when purchasing a laptop. Arrow Keys – A lot of time is spent selecting cells in the worksheet. Whether selecting a range of cells to copy/paste or navigating around the worksheet to enter formulas, you will find the arrow keys can be a fast alternative using the mouse. This means that your keyboard should have a dedicated set of arrow keys in a location that is easy for your fingers to find and press. Again, this is pretty standard on external keyboards, but laptop keyboards are a different story. 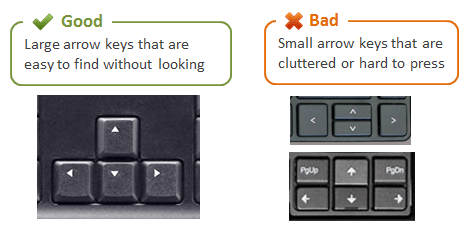 Many laptops have condensed the arrow keys to save space, making the keys very small and hard to press. So it's best to consider the size and location of the arrow keys when purchasing a keyboard. Page Up & Page Down – I frequently use the Page Up and Page Down keys to navigate through the worksheets in a workbook. For these shortcuts you can use your right thumb on the right Ctrl key, and right index or middle finger on the Page Up/Down keys. The location of the Page Up/Down keys is pretty standard on an external keyboard, but NOT on a laptop keyboard. Many laptop keyboards do not have Page Up/Down keys, or they are multi-purpose keys requiring you to first press a function key. Home & End Keys – These keys can be used to navigate and select cells in the worksheet. The Home & End keys are usually located next to the Page Up/Down keys, but this can be different on a laptop keyboard. These keys are really important to have, especially when you are working with large spreadsheets that require you to navigate to the top/bottom of the sheet quickly. Escape and Function Keys – I frequently use the Escape and Function keys when writing formulas. Pressing the F2 key when a cell is selected jumps into formula edit mode. This opens the cell for editing and displays the formula text in the cell. Pressing Escape exits formula edit mode without modifying the formula. The F2 and Escape combo is great when you are reviewing or auditing formulas. Pressing F2 will jump into formula edit mode and the cells/ranges referenced in the formula will be highlighted on the sheet with colored borders around them. This lets you quickly check the cell references for any inconsistencies. You will also want to make sure that the Function keys are enabled in the default state of the keyboard. Most laptops make the Function keys multi-purpose keys, meaning you might have to press a function button before using the function key. I believe this is true on the Mac Books, and it can really slow you down when working in Excel. 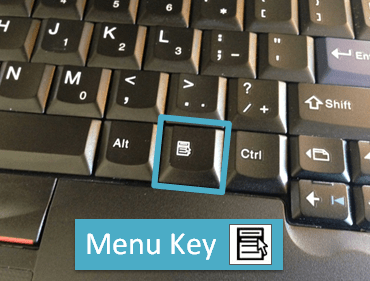 Menu Key – The Menu Key can be used to convert text to numbers, ignore formula errors, and access paste options like paste values. Checkout my recent post on the Menu Key for more details. This key can also be used to display the right-click menu when cells are selected in a worksheet. Not all keyboards contain a Menu Key as you can read in the comments at this post on Chandoo.org. I would consider this a “nice to have” key, and it is not critical if it is missing from your keyboard. Numeric Keypad – The numeric keypad is pretty standard on most external keyboards. I use the “+” and “-” keys on it the most when adding/deleting rows and columns (Ctrl+”+”/Ctrl+”-“). Some laptops contain a numeric keypad, but it tends to make the laptop bigger and heavier. I have owned laptops with that contain a keypad, but honestly didn't find it to be worth the weight. It will depend on how much numeric data entry you are doing. External keypads can also be purchased and used with a laptop. These can be handy if you are just need it for a specific task, but don't use it all the time. Some of these keys can be very handy, but a lot of times they take up space that would otherwise be used for the more the important standard keys. I recommend looking for a more classic looking keyboard that does not overwhelm you with media keys, unless you really feel you need them. You want your fingers to navigate across the keyboard as fast as possible, and often times the media keys can slow you down. Keyboards come in all shapes and sizes, and having a keyboard that is conducive to Excel keyboard shortcuts will make your life a lot easier. It is best to look for a more traditional looking keyboard that does not contain too many bells & whistles. These additional features tend to get in the way, and can sometimes cause the most important keys to be left off the keyboard entirely. This is especially true when purchasing a laptop. 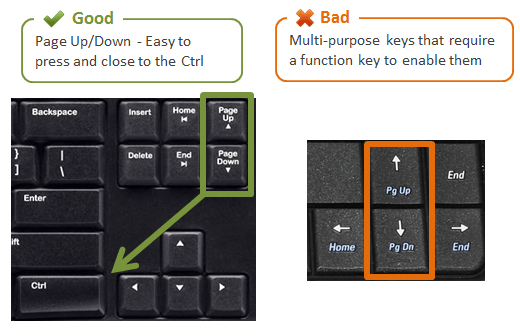 The diagram below outlines all of the keys you will be using the most to perform the most commonly used keyboard shortcuts in Excel. The following are a few keyboards I would recommend based on the criteria above. Again, this is a matter of personal opinion and it is best to try a keyboard to see if you like it. The links are to Amazon.com and they have a great return policy/program if you don't like the product. These are affiliate links, which means I make a small commission from any sales generated from a purchase after the link is clicked. You still get the same low prices that Amazon offers. This just helps support the cost of maintaining this website and I want to thank you for your support. Logitech K270 Keyboard – This is the keyboard I used for all of the “Good” images above and the diagram. I have personally used this keyboard and really like it. It has a very simple and compact design that makes it easy to perform Excel keyboard shortcuts. The keys are very quiet when pressed, which your neighbors will appreciated. Logitech's Wireless Unifying Receiver technology works really well. The mouse and keyboard both connect wirelessly through one very small USB plug, and you can quickly connect them to any computer that has a Unifying Receiver plugged in. The USB plug can be stored in the mouse, which makes it great for travel. I've noticed that the current K270 listed on Amazon does NOT have the Unifying Receiver. It still has a wireless receiver, but that receiver cannot be paired with other Logitech mice. So you are stuck using the included mouse, or plugging in an additional receiver. This might change in the future, so check the product description on Amazon to see if it has the Unifying Receiver. I also found the K270 on NewEgg.com that does have the Unifying Receiver. I ordered this one recently (in 2016) and it did have the Unifying Receiver. It's more expensive than Amazon, but still worth it. I have been using this keyboard for years and still love it for it's simplicity and functional design. Microsoft Wireless Desktop 3000 – This is another keyboard & mouse combo that I have enjoyed using. Compared to the Logitech, it is a bit larger in size and the keys feel more spread out. It is not as quiet when pressing the keys, and has too many media buttons for my liking. The only thing I really don't like is the size of the Escape and Function keys. The keys are smaller and sometimes hard to find and press. The mouse is a nice size and overall the combination works well for Excel. Microsoft Wireless Comfort Desktop 5050 – I have not personally used this keyboard yet, but have co-workers that rave about these curved style keyboards. They are supposed to be more ergonomically fitting for your hands. This combo from Microsoft is the most popular online and gets pretty good reviews. The only thing I'm not crazy about is the size of the Escape and Function keys. Again, they have been shrunk down to make room for the media keys. It's something to consider, but not necessarily a deal breaker for me. Purchasing a laptop is a much tougher decision. I consider the keyboard to be one of the most important features to consider. Most of the hardware and memory inside the laptop can be upgraded/modified depending on the manufacture, but the keyboard is permanent and you have to live with it. I highly recommend testing out the keyboard before making a purchase. I have made the mistake of not doing this, and paid for it. I really like the keyboards on the Lenovo ThinkPad Laptops. I am currently using an X1 Carbon and I really like the laptop and its keyboard. The Lenovo keyboards are very comfortable and it's easy to find the keys. They meet most of the criteria listed above, with the exception of the location of the Ctrl key. Most Lenovo keyboards have the Fn function key to the left of the Ctrl key. The Fn (function) key can be locked so that the F1-F12 keys are pressed by default without having to hold Fn. This is a big plus. On negative side, the keyboard also lacks a Menu Key. Even with those two drawbacks, I still find the Lenovo laptop keyboards to be the easiest to type on. The nice part is that you can always attach an external keyboard to the laptop when you are doing some labor intensive keyboard work. Did I miss anything? What are some of your most commonly used keys and shortcuts? What is your favorite keyboard or laptop? Please leave a comment below. Absolutely loved this!! This is a Comprehensive & helpful list You have got some great posts in your blog. Keep up with the good work. Knowing the keyboard shortcuts for the excel is very important as the user of the excel can do the things which the user was facing more time to do that and by the shortcuts, a user can do the similar task faster than it used to be. That’s called smart work !!! helps to save time In the Excel, clients need to utilize some alternate way strategies for the console which will extremely incredible efficiency and the CPU usage level too. You may some other arrangement from that unquestionably extremely productive to you. Great article, thank you! I just realised I have both a logitech keyboard and mouse (5yrs now), both with a unifying receiver – I’ve just paired both to a single receiver and have freed up a USB port, I would never have known if not for your article. Thanks again Jon. Once I went with a Mechanical Keyboard, everything else feels like a kids toy. Most I’ve seen have the features you mention. You won’t find it wireless, but most come with a decent length braided removable cable. Have been an analyst for several years, and it was one of the best upgrades I’ve made. This may be a pretty stupid question but will typical excel shortcuts work with a mac laptop if I am using a wireless keyboard? Not a stupid question at all. The shortcuts should work with the keyboard as long as it has the Command key. A lot of Mac shortcuts require the Command key. I hope that helps. Very nice article! I also have a Lenovo laptop and first hated the placement of the Fn key in the bottom-left corner. Then I found out that you can swap the Fn and Ctrl keys in the BIOS menu. Made my life much easier. It is a shame what Lenovo has done to their, once fantastic, keyboard layout (but that’s probably for another blog…). my very grateful to you. 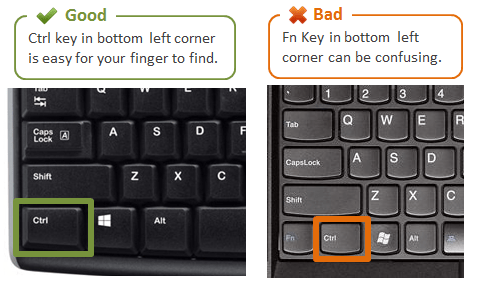 The three desktop keyboards you linked do not have the pageup/pagedown keys in the 3×2 configuration where they appear on either side of the up arrow. I am coming from a Dell laptop which had this layout and desperately want that in my new desktop keyboard. Any suggestions would be immensely appreciated. Thank you! Great question! The only ones I have found are compact keyboards that are similar in size to the laptop keyboards. Here is a compact keyboard by Lenovo that has that layout. There are other compact keyboards on Amazon with this layout. I haven’t found any full size ones though. Let me know if you do. Thanks! how to add all boarder ctrl + shift + & not all boarder. Alt+H,B,A is the keyboard shortcut to press the All Borders button on the Home tab of the ribbon. This is for the English version of Excel. Please let me know if you have any questions. Thanks! I have been working heavily in Excel the past year and have wondered why a company has not sold a dedicated keypad for Excel. Seems to be besides the F2 and Esc nearer to the numbers, why wouldn’t it be beneficial to have the = sign and others in a portable, wireless device? That is my main pet peeve of working on a keyboard. The equal sign is away from the ‘home position’ I have when keeping my left hand on the Esc key and the right on the keypad. 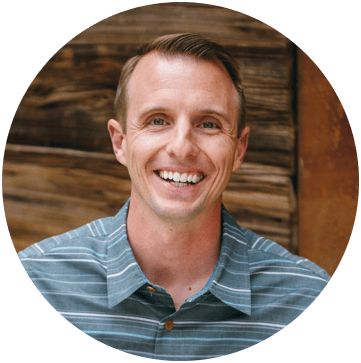 Is it a matter of cost or that most people are not so stuck in designing Excel after Quickbooks came along? Or should I go make my fortune assembling a keypad such as this? I completely agree. It would definitely be beneficial to have an equal sign key on the left side. I’m not sure why there is no keyboard made for Excel. My guess is that it is not really compatible. If you want to teach others or use someone else’s computer, then you would be fumbling with the keys. Although a lot of people use QB, a lot more people still use Excel. The other problem I see is that you would never get everyone to agree on a standard layout. One little trick I see people do is start a formula with a “+” sign instead of an “=”. I think the main reason for this is because that used to be how it was done in Lotus (old spreadsheet program). But on a standard keyboard the “+” symbol is on the right edge of the keyboard, making it easy to press with your thumb while your hand is still on the mouse. When you start a formula with a plus, Excel will automatically add the equal sign after you press Enter. I’m NOT a big fan of starting a formula with a “+” symbol because I think it looks a little messy and can be confusing. But it’s just personal preference. Anyways, I hope that helps. Great article! To me, the most annoying change is the elimination of the traditional key “sextet” (Insert, Home, Page Up, Delete, End, Page Down) and the addition of a new sextet (Page Up, Arrow Up, Page Down, Arrow Left, Arrow Down, Arrow Right). I have been using Dells laptops for about 15 years. Work supplies them via 3-year leases. Dell was great on keeping the same keyboard layout while renewing designs, including using the traditional key sextet. However, this changed about 3 years ago and now most Dells use the new sextet. Since then, I have been forcefully and painfully working on getting used to this new layout. To make things more fun, I just bought an Inspiron 7000 for home. Unfortunately, a new change has been introduced. They eliminated the Page Up and Down keys, and add them via Fn combination to the up and Down keys. It seems like this is a new annoying trend. Do you know if there is a laptop out in the market that features the traditional key sextet? I feel your pain! Keyboard design in the last few years has been more about aesthetics than functionality. I think there is some Apple influence going on here. Personally I’m not a big fan of the chiclet style keyboards and abundance of dual purpose function keys. I have a Lenovo T420 that has a keyboard that comes very close to the six key layout you are referring to. Unfortunately, the new models have moved away from this. They still have dedicated page up/down keys, but they are in a weird place next to the arrow keys. As Excel users we are heavily dependent on the keyboard layout for working efficiently. I sometimes wonder what other software programs use the keyboard to this extent, and if there isn’t as much demand for it anymore. Let me know if you find any other laptops with the six key layout. 1) How to remove the breaks on the spreadsheet. I applied them and later hit “remove breaks”; they just remain where they initially appeared (I would also like to know how, where to place them, it seems the system does it automatically. a) Freeze the last column (e.g. column “H” and be able to move it next to the first column (e.g. column “A”). b) How to color the lines I am gradually working on column A and B(one by one once I finish a procedure), and then at the very end undo the freezing displaying the color all along columns at once. Thank you. I like the pgup, pgdn keys in a 3×2 arrangement rather than the 2×3 arrangement. It’s getting really hard to find those, so I’m going to have to bit the bullet eventually and learn the 2×3. The fact that your first example was the Fn key made me feel that I’m not alone in the world. I hate that key when I switch from desktop to laptop. Great question Don! You can add some simple VBA code to your personal macros workbook to disable the F1 key. This article will walk you through it. One commenter on this LinkedIn discussion had a suggestion for sticking a paper clip under the key so it can’t be pressed, instead of completely removing the key. another great article. from my experience, the simpler more traditional keyboards seem to work the best for office work. I have a home office keyboard with multi function media keys and it’s quite annoying. One “trick” i’ve used, on most keyboards I pop off the F1 key because I’ve hit accidentally many times while using the F2 key to edit. Anyone have a better solution than popping off the key for fat fingers?